Share market HIGHLIGHTS: BSE Sensex closed Thursday's trade 119 points higher, while the Nifty ended firmly above the 10,600 level. Jet Airways share price skyrocketed 25% amid reports of a likely Tata Sons-Jet Airways deal. Yes Bank shares cracked 7%. Stock market HIGHLIGHTS: A strong rupee, along with positive Asian markets and healthy buying in financials, realty, metals, and auto stocks, pushed the Sensex and Nifty higher to close Thursday’s trade in the positive territory. 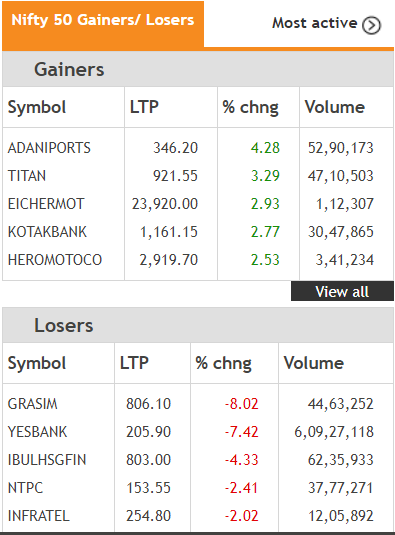 However, weak European markets and profit booking in FMCG stocks capped some gains. The rupee extended gains on Thursday, rising past the 72/$ mark on the back of fresh foreign fund inflows and easing crude oil prices. The BSE Sensex closed today’s trade higher by 118.55 points or 0.34% at 35,260.54 points. The market breadth remained bullish with 1,498 advances as against 1,098 declines. Kotak Bank was the top contributor to the Sensex, followed by the HDFC twins, Axis Bank, ICICI Bank, Larsen and Toubro, Maruti and Infosys. Adani Ports was the top gainer on the Sensex (up 4%), while Yes Bank was the top drag, down 7%. The NSE Nifty 50 closed Thursday’s trade at 10,616.70 points, up 40.40 points or 0.38%. Among the 50 trading companies on the Nifty, 29 scrips advanced as against 21 declines, indicating a bullish market. 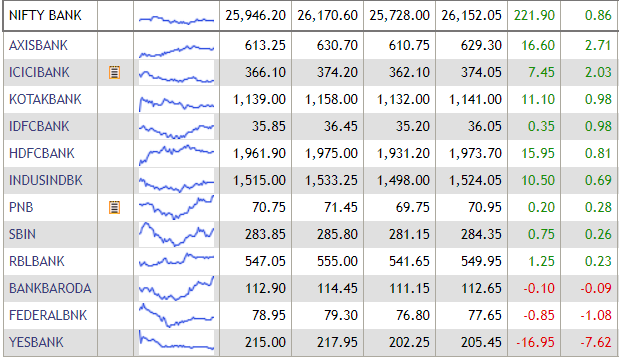 All the Nifty sectoral indices closed with gains, barring the Nifty FMCG index which closed lower by 0.09%. The Bank Nifty ended higher by 0.87%. Among stocks, Jet Airways share price skyrocketed 25% on the BSE amid reports of a likely Tata Sons-Jet Airways deal. Jet Airways shares surged to a high of Rs 302.70 on the BSE, the stock’s biggest intra-day move in over three years. Yes Bank shares tanked 7% today, a day after the bank announced that Ashok Chawla has resigned as non-executive chairman. Telecom operator Vodafone Idea’s shares tanked nearly 8% in early morning trade after the joint entity in its maiden earnings announcement reported a consolidated loss of Rs 4,973 crore for the September quarter. "After a subdued start the market gained some momentum supported by strong rupee and positive Asian peers. Drop in US 10yr bond yield followed by gradual pick up in FII inflow to domestic market and slide in oil prices eased the concerns of liquidity. Uncertainty over US - China trade deal and next FED policy which is likely to see hike in December may add volatility in the near term". BSE Sensex closed Thursday's trade 119 points higher, while the Nifty ended firmly above the 10,600 level. Jet Airways share price skyrocketed 27% amid reports of a likely Tata Sons-Jet Airways deal. Yes Bank shares cracked 7%. Jet Airways share price skyrocketed 17% amid reports of a likely Tata Sons-Jet Airways deal. Jet Airways shares surged to a high of Rs 302.70 on the BSE, the stock's biggest intra-day move in over three years. Jet Airways added over Rs 650 crore in market capitalisation today. The rupee gained past the 72/$ mark during the mid-afternoon trade session on Thursday. Earlier on Wednesday, the Indian rupee rose to its highest since September 21, boosted by a fall in global oil prices and on the central bank’s announcement a day earlier that it would buy bonds via open market operations. The rupee extended the appreciation today on fresh foreign fund inflows and easing crude oil prices. The currency gained nearly 37 paise to an intra-day high of 71.9438 against the US dollar, Bloomberg data showed. Rupee currently traded at 71.9613 against the greenback. Oil prices stabilised on Thursday, reversing earlier declines, but market sentiment remained cautious over concerns that a supply glut may emerge amid a glum economic outlook, according to a Reuters report. Front-month Brent crude oil futures were trading at $66.17 per barrel at 0737 GMT, up 5 cents from their last close. U.S. West Texas Intermediate (WTI) crude futures were at $56.29 a barrel, up 4 cents from their last settlement, the report said. Traders said the benchmarks reversed earlier losses on signs China and the United States may be taking steps to de-escalate their bitter trade dispute. Despite this, oil prices have lost around a quarter of their value since early October as supply soars just as demand is expected to slow down along with an economic downturn. The Nifty IT index gained on Thursday, with shares of IT majors like Infosys, Tata Consultancy Services, HCL Technologies, Wipro and Tech Mahindra trading in the green. However, MindTree and Infibeam Avenues shares lost up to 1%. The Nifty PSU Bank index reversed early morning losses and traded with gains during the mid-morning trade deals today. Shares of major PSU Banks like Axis Bank, ICICI Bank, Kotak Bank, IDFC and HDFC Bank traded higher. Why did Yes Bank shares tumble today? Shares of India’s private sector lender Yes Bank tumbled on Thursday morning, after former bureaucrat Ashok Chawla resigned as non-executive chairman of the bank. Yes Bank share price tumbled by more than 9.05% to hit the day’s low of Rs 202.25. PTI reported sources as saying that Chawla offered to quit as the controversy was being generated on his continuance on the board of directors following his name appearing in a CBI charge-sheet in the Aircel-Maxis case. Shares of Vodafone Idea on Thursday plunged over 9%to Rs 37.60, their lowest since October 31, day after the newly combined entity reported Q2 loss of Rs 49.74 billion. Global brokerage house Jefferies has said it expects Idea to be the number 3 player by early FY20 and continue to lose market share over next two years. Jefferies has retained “underperform” on the stock and cut price target to Rs 30 from Rs 50. Jet Airways share price surged nearly 8% in early morning trade deals today amid speculation that Indian conglomerate Tata Sons’ chief is likely to pitch for board’s backing to acquire the Naresh Goyal-led airline. Notably, Jet Airways shares climbed to over two-month high of Rs 278.30 per share on the BSE, a level last seen on September 11, when the airline’s shares had scaled an intra-day high of Rs 282.10 per piece. The stock has rallied nearly 60% in the period of over a month since October 1, 2018. Asian stocks rose on Thursday, cheered by a bounce in Chinese equities on signs China and the United States may be taking steps to de-escalate their bitter trade dispute, while oil prices resumed their retreat on fears of oversupply, said a Reuters report. A cautious start is expected in Europe, however. Spreadbetters see Britain's FTSE opening flat, Germany's DAX slipping 0.25% and France's CAC losing 0.2%. US Dollar is on the defensive today after touching 97.30 on back of strong Euro and Pound. Meanwhile, Indian Rupee is appreciating against US Dollar on back of weak Crude oil prices. There is perfect co-relation between INR and Crude oil prices. Below 72 levels, support for rupee comes at 71.60 and we expect Rupee to bottom around that level. Crude oil is already in oversold territory so we expect a technical bounce in crude oil prices which will put additional pressure on our currency. Meanwhile, as long as INR is trading below 72.60, chances of rupee testing the lows of 71.60 are high. GMR Infrastructure's consolidated net loss for the September quarter narrowed to Rs 218.86 crore as against a net loss of Rs 404.46 crore in the same quarter last fiscal. In a regulatory filing to the BSE, the company said its total income during the second quarter of this fiscal stood at Rs 2,025.72 crore, up 2.61% as against Rs 1,980.92 crore in the year-ago period. While revenue from airports business grew by 11.86%to Rs 1,315.52 crore in the period under consideration, revenue from power segment fell by 41.93% to Rs 178.17 crore. Shares of GMR Infra were trading 1.54% lower at Rs 15.95 per share on the BSE. PSU Banks shares were trading on a mixed note during the mid-morning trade deals today. The PSU Bank index was down 0.41%, with shares of Bank of India, Canara Bank, Vijaya Bank, SBI, Central Bank of India and Indian Bank trading in the red. Shares of Apollo Hospitals jumped over 4% in early morning trade deals today after the company reported an 11.39% rise in its standalone net profit to Rs 78.98 crore for the quarter ended September 30, 2018, mainly on account of rise in revenue from operations. The company also said it is divesting its front-end pharmacy business to Apollo Pharmacy Ltd for a lump sum cash consideration of Rs 527.8 crore as part of a restructuring exercise. Apollo Hospitals shares rose 4.35% to a high of Rs 1,216.90 per share on the BSE. Shares of Grasim Industries cracked nearly 9% in early morning trade on Thursday after the company reported a net loss in the second quarter ended September 2018. The Aditya Birla Group firm reported a consolidated net loss of Rs 1,299.86 crore for the quarter under consideration on account of an exception item related to the merger of Vodafone with Idea Cellular. Grasim Industries shares plunged by 8.74% to a low of Rs 800.30 per share on The BSE. Telecom operator Vodafone Idea's shares tanked nearly 8% in early morning trade on Thursday after the joint entity in its maiden earnings announcement reported a consolidated loss of Rs 4,973 crore for the September quarter. The company also announced a fund infusion of Rs 25,000 crore to help it take on cut-throat competition. Vodafone Idea's shares plunged 7.85% to a low of Rs 38.15 per share on the NSE. The rupee appreciated 24 paise to 72.07 against the US dollar at the interbank foreign exchange on Thursday on fresh foreign fund inflows and easing crude oil prices. Provisional data from the stock exchanges showed that foreign institutional investors (FIIs) bought shares worth Rs 277.38 crore on Wednesday. The strength in the rupee was also supported by increased selling of dollars by exporters and the American currency's weakness against some currencies overseas, PTI reported quoting currency dealers. Earlier on Wednesday, the rupee had gained 36 paise to end at 72.31 against the US dollar as global crude oil prices hovered near one-year lows, easing concerns over expanding current account deficit and inflation. Shares of Jet Airways soared over 7% in opening trade on Thursday after media reports said Tata Sons chief is likely to pitch for board’s backing to acquire the struggling airline. Tata Sons chairman N Chandrasekaran is likely to present a business viability plan to the board on Friday on the proposed acquisition of the beleaguered airline, according to a report by TOI. Jet Airways share price rose by 7% to a high of Rs 276 per share on the BSE. Yes Bank shares cracked nearly 6% in opening trade on Thursday, a day after the bank announced that Ashok Chawla has resigned as non-executive chairman. Chawla offered to quit as the controversy was being generated on his continuance on the Board of Directors following his name appearing in a CBI charge sheet in the Aircel-Maxis case, PTI reported citing sources. Yes Bank shares plunged by 5.6% to a low of Rs 210.25 per share on the BSE. The BSE Sensex, after opening on a flat-to-positive note on Thursday, rose by over 100 points in the first 10 minutes of trade led by healthy buying in most auto, IT and pharma stocks. The NSE Nifty, too, gained and reclaimed the 10,600-mark. Yes Bank: Ashok Chawla has resigned as non-executive chairman of Yes Bank, the private sector bank said on Wednesday. Chawla offered to quit as the controversy was being generated on his continuance on the Board of Directors following his name appearing in a CBI charge sheet in the Aircel-Maxis case, PTI reported citing sources. Vodafone Idea: The telecom operator has announced a fund infusion of Rs 25,000 crore to help it take on the cut-throat competition. Jet Airways: Tata Sons chairman N Chandrasekaran is likely to present a business viability plan to the board on Friday on the proposed acquisition of the beleaguered airline, according to a report by TOI. Grasim: Aditya Birla Group firm Grasim Industries reported a consolidated net loss of Rs 1,299.86 crore for the quarter ended September 2018 on account of an exception item related to the merger of Vodafone with Idea Cellular. Apollo Hospitals: Apollo Hospitals Enterprise said it is divesting its front-end pharmacy business to Apollo Pharmacy Ltd for a lump sum cash consideration of Rs 527.8 crore as part of a restructuring exercise. Coffee Day Enterprises: Coffee Day Enterprises reported a 59.78% fall in consolidated net profit at Rs 23.83 crore for the September quarter due to higher expenses. The BSE Sensex traded on a flat note with a negative bias during the pre-open trade session on Thursday. The rupee opened at 72.0583 against the US dollar from its previous close at 72.3125 per dollar, Bloomberg data showed. Oil rose about 1 percent on Wednesday, recouping some of the previous session’s heavy sell-off, on growing prospects that the Organization of the Petroleum Exporting Countries and allied producers would cut output at a meeting next month to prop up prices. After a record 12 straight days of losses and the steepest one-day loss in more than three years, the oil market reversed course after Reuters reported that OPEC and its partners were discussing a proposal to cut output by up to 1.4 million barrels per day (bpd), more than officials had mentioned previously. 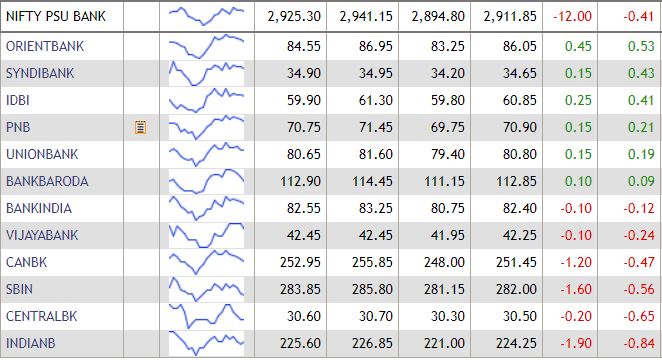 Weakness in financials and FAANG stocks, led by Apple, weighed on the US Indices. Indices closed lower for the fourth session on the trot, its longest losing streak in three months. Global markets will breathe sigh of relief as the UK Prime Minister Theresa May's Cabinet had agreed to a Brexit deal. The pound and euro will get a boost against the dollar and in turn help our currency as well. Today is the last day of the earnings season for our markets. Expect last benchers generally to announce results lesser than markets expectations. Crude oil has slightly rebounded from its recent rout, though lower crude oil prices has wider ramifications for our markets. Low crude oil prices will feed better margins for many sectors and specially help Oil marketing companies, Airlines, Tyre and Paint companies. Lower crude will lead to lower inflation – which is a good news for our debt markets. Foreigners recognise the improving prospects of our bonds and have lapped up $1.3 billion worth of bonds in last none sessions. Falling treasury yields will also help PSU banks outperform the markets. Yes bank and Kotak bank have to tackle their own leadership and ownership issues respectively and are likely to remain in limelight today. We likely to reiterate that we feel banks can lead this markets higher. Nifty has support near 10400 and we can raise the stop to that level for long positions. Stock market on Wednesday: BSE Sensex ended Wednesday’s trade with nominal losses, down 2.50 points or 0.01% at 35,141.99 points. The market breadth was bearish, as 1,393 stocks declined as compared to 1,203 advances. However, mid-cap stocks outperformed on stock-specific buying on the basis of quarterly corporate earnings and decline in crude oil prices, said market observers. The S&P BSE mid-cap index closed Wednesday’s trade higher by 0.19%. The NSE Nifty ended 6.20 points or 0.06% lower at 10,576.30 points.